fredvs wrote: Only by curiosity, are you able to compile the RTL (using the script + Makefile) on a real XP Windows machine (not emulated or virtual)? If yes, then there is a (little) bug in Wine. Just tested on a Windows XP SP3 VM (VirtualBox) and it works without error, no chance of testing on a physical machine these days but I would argue that the VirtualBox VM is proof enough. fredvs wrote: Anyway, I did try the ultiboinstaller.sh on Linux Debian 9.5 64 bit ---> out-of-the box and working perfectly ---> wow. fredvs wrote: But same result in the Rpi3, for the 3 demos, a beautiful square on screen colored like a rainbow. Let us test those examples again and see what result we get. Ok, I've tested the 3 fpGUI examples and all of them work on a Pi 3B+. All were built with the current Ultibo RTL and using the build_ultibo.bat file in each of the folders. The aggcanvas example sometimes shows a blank display even though mouse, keyboard, network etc are all working so that is odd but it is likely just something that will get resolved as we continue the work. I'm not sure why you get the rainbow colored square, something is obviously different from our setup but I wouldn't spend too much time looking at this point as there is still a lot of work to do to make fpGUI usable in a project. Ok, I've tested the 3 fpGUI examples and all of them work on a Pi 3B+. So, aaargh, I surely did something wrong. OK, I will re-jump into fpGUI-Ultibo code. Thanks for this and sorry for the noise. Ultibo wrote: All were built with the current Ultibo RTL and using the build_ultibo.bat file in each of the folders. Ha, ok, that way I get something else than using the *.lpi + Lazarus-Ultibo (and their beautifull screen colored like rainbow). 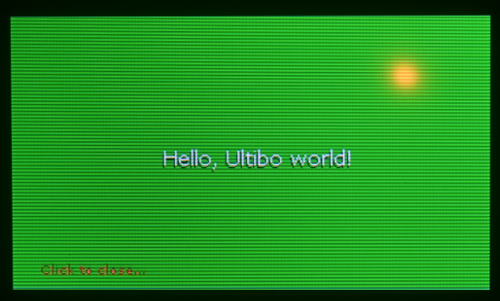 OK, the HelloWorld_ultibo demo is working now. But the mouse and keyboard do not work. For the demos fpgcanvas_ultibo and agg_canvas_test_ultibo I get only a black screen. Anyway, the HelloWorld_ultibo shows that you are on the right way. I do not know how to help you at this stage, maybe only by testing? If you see something that can help, please order. fredvs wrote: Ha, ok, that way I get something else than using the *.lpi + Lazarus-Ultibo (and their beautifull screen colored like rainbow). Ok that makes sense now, the Lazarus lpi files have not been properly converted and tested so we included a batch file to build the project instead. When we get more of it working I expect that we will remove the batch files and create proper Lazarus lpi files instead. fredvs wrote: But the mouse and keyboard do not work. As per the Readme there are lots of things that don't work including mouse and keyboard support. fredvs wrote: For the demos fpgcanvas_ultibo and agg_canvas_test_ultibo I get only a black screen. That might be the same problem we see with aggcanvas, sometimes it works and sometimes it just shows a black screen even though the Pi has booted and the network, filesystem etc are all working. fredvs wrote: I do not know how to help you at this stage, maybe only by testing? Yes, testing is good. Even at this early stage just testing what functions do and don't work is useful even though it isn't possible to create a usable GUI. The best way to help is to make use of what we have already put into Ultibo and share that with others to help spread the message about what it can do and how you can use it. We know people want to see things like GUI, WiFi, Bluetooth, Audio, Video and lots more but we've already provided more functionality than most projects out there. Now we want to see what people can do with what is already available. It seems to work of my Aarch64 Gentoo64 Pi. And the x86_64 version works on my Linux Mint box. Needs some install tweaking as the compiler is called ppca64 and is buried in the lib/fpc/3.3.1 folder. So will it compile Lazarus and the Ultibo version and the 32bit armhf compiler? Does that mean a videocore camera or OpenVG app could run in Aarch32 state while the rest runs Aarch64? Three cores running Aarch64, one Aarch32, 2 x 64 + 2 x 32bit? All this openxx stuff is a thin layer on a GPU executed code, so they should be able to rebuild on A64. From this list only wifi/bluetooth is over my knowledge now.